Share "Tips for Building a Waterfall for Your Pond"
Nothing is more relaxing than the gentle gurgle of your own backyard waterfall, but how can you add one to your pond? 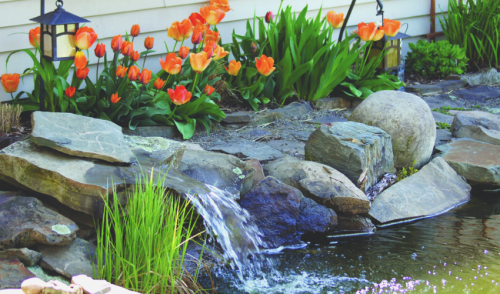 It can be easier than you think to enhance your pond with a simple waterfall. Why Add a Waterfall to Your Pond? Aerating and oxygenating water for plants, fish, frogs, turtles, and other members of your aquatic ecosystem. Minimizing any standing water in the pond that could nurture mosquito colonies and other unwanted insects. Slowing algae growth that can clog filters and other pond mechanics, reducing their efficiency or causing equipment failure. Drowning out other local noises such as traffic, construction, or barking dogs to create a more peaceful atmosphere. Attracting birds and other wildlife through the splashing noises, movement of the water, and sparkles of reflected light. Creating a stunning focal point for landscaping and beautification, allowing for extra lighting, different plant arrangements, etc. With so many benefits to enjoy, it’s easy to see why waterfalls are such desirable water features. Waterfall Placement If your waterfall will be in full sunlight, water from the spill and spray will evaporate more quickly and you may need to top up the pond more often. Also note that overhanging plants can drop leaves and other debris that may clog the pump if the pond is not skimmed regularly. Erosion Potential It is important that the waterfall land directly in your pond’s basin or only splash off nearby rocks, without splashing on adjacent banks. If the waterfall is splashing on banks, it will dramatically increase erosion that may destabilize your pond’s edge. Pump Strength The pump that will power your waterfall needs to be strong enough to efficiently move the necessary amount of water to keep the flow running. The height of the fall, the width of the waterfall, and the flow rate of the stream will all impact the pump’s required strength. Pump Placement Where you put your waterfall pump will dramatically impact how efficient the waterfall is at aerating and oxygenating the pond’s body of water. Positioning the pump as far away from the waterfall as possible will help spread the oxygen over the largest area for even distribution. Spigot Style There are many types of spigots you can choose for your waterfall. A simple tube can be disguised or hidden with stacked rocks, creating a natural look. Copper or steel pipes give the waterfall a more industrial vibe, or you might choose a hand pump, spitter, or statue fixture. Cascade Structure You can create several types of spillways for a backyard waterfall. The easiest is stacked stone for a free-falling cascade, but you can also build a stream-like track or opt for a preformed rock-like structure to guide your waterfall to the pond. Angles Be careful when considering the angles of your waterfall to eliminate backflow that can allow water to seep into unexpected places that may destabilize the structure or accidentally drain the pond. Angle rocks and slopes slightly forward to guide the water more easily. Once you have your waterfall in place, do a brief test run of the cascade and watch carefully to see where the water flows. This can help you determine if there are any misaligned rocks or inadequate slopes, and you can make adjustments as needed. It may also be necessary to use sealant to fill in cracks and keep the water in the right track. Building a waterfall for your pond can dramatically increase your enjoyment of the water feature. While simple waterfalls can be simple to add, if you’d like a more elaborate arrangement or if your yard has special challenges, contact us for expert help in designing and constructing the perfect waterfall for your pond. We’d love to help your waterfall dreams splash into reality!